We’ll be live-blogging the elections during the 10th session of the Assembly of States Parties on Monday-Tuesday Wednesday Thursday Friday. Post-script: Many thanks to @USfortheICC, @EBBJena, @CGS_DC, @_CICC and @bechamilton for their contributions and assistance when webcasts of the voting wasn’t available. 3:20pm — 13th round of voting underway. Four candidates – 2 European and 2 African – competing for last two seats. No withdrawals from last round, and no one eliminated as number of candidates equal twice number of seats. If this round seats another candidate, the 14th round could be an elimination round as we’ll have 3 candidates for one seat – whoever comes in last in that round will be eliminated from the 15th. 3:45pm — Howard Morrison from the UK elected. 3 candidates, 2 seats remain. Round 14 in 15 minutes. 4:06pm — African states used 15min break to facilitate withdrawal of Boolel from Mauritius. Nigerian candidate Eboe-Osuji and French candidate Cathala will go forward into next round. To be seated, the candidate must still get the necessary 2/3 majority (~73 votes depending on how many valid ballots are cast). 4:30pm — Nigeria’s Eboe-Osuji will be seated in next round of voting. Secured 68 votes in 14th round, not enough to win, but France withdrew its candidate. 15th round to be a formality. 5:15pm — Eboe-Osuji’s election (102 votes, being sole candidate) in the 15th round concludes the week’s fun. 3:25pm — Mexico’s candidate, Javier Laynez Potisek, withdraws his candidacy. He was one of four candidates with the Independent Panel had assessed as “not qualified” in terms of experience under Article 36 of the Rome Statute. So far, none of the “not qualified” candidates have been elected. 3:35pm — Ninth round of voting about to begin. 6 candidates remain for 3 seats. The MVRs require that 1 more judge from Latin America be elected. Only 2 such candidates remain – Ortega from Costa Rica, who the independent panel considers not qualified, and Carbuccia from Dominican Republic, who is considered qualified. 3:45pm — Table of vote counts for the first 8 rounds have been published on Wikipedia by @EBBJena. 4:18pm — from @USfortheICC: No candidate elected in 9th round of #ICC judicial elections. Morrison of UK was 5 votes short of number required to win. 10th ballot soon. 4:20pm — @EBBJena points out that this election has just become 2nd longest election after initial election in 2003 when 33 ballots were needed for 18 judges. 4:30pm — Chile Eboe-Osuji (Nigeria) is the only candidate to have gained votes every round. 4:48pm — Latin American group engaged in consultations over #ICC candidates, asks for delay in 10th ballot. Will Ortega step aside? 5:12pm — Bit of confusion as 10th round of voting was to get underway. The round has been suspended, and ballots cancelled. 5:47pm — @USfortheICC: Several delegations say that the integrity of 10th ballot of #ICC judicial elections was seriously compromised. Still no word on next round. 5:54pm — and we’re back. Consultation over and 10th round beginning anew. Almost certainly last round today… will any of the 6 remaining candidates secure enough votes to be seated? 6:35pm — Costa Rican candidate Oretega withdraws from race after receiving only 31 votes (last place) in Round 10. He was the final “not qualified” candidate still standing, and likely the subject of the consultation that led to the “first” Round 10 confusion. UK’s Morrison scored 62, Nigeria’s Eboe-Osugji received 61 votes, Dominican Republic picked up 52, France’s Cathala secured 45, and Boolell from Mauritius came in at 40. Surprisingly, we proceed to another ballot. Translators working overtime tonight. 7:07pm — No winners from 11th round, but Carbuccia comes close – just 2 votes shy of required majority. Expect her to pick those up from Ortega’s supporters in Round 12. AMICC (@USfortheICC) summarized this evening’s earlier confusion at http://amicc.blogspot.com/2011/12/unusual-episode-on-third-day-of.html. 7:39pm — Carbuccia wins a seat! Received 77 votes in 11th round. 4 candidates, 2 seats remain. Next round (#13) scheduled for tomorrow afternoon. 7:45pm — Carbuccia’s election fulfills the geographic and list-related minimal voting requirements for this year’s election of judges. Only outstanding requirement is the gender criteria, requiring election of 2 more men — all 4 remaining candidates are male, so it’s a done deal. 3:00pm — Round 6 of elections for the three remaining judicial seats is expected to start shortly. 3:22pm — Polish candidate Władysław Czapliński withdraws his candidacy. All remaining “qualified” candidates are A-Listers. 4:41pm — Matthew Lee reports the following voting results from Round 6: Morrison (UK): 71, Cathala (France): 54, Eboe-Osuji (Nigerian): 52, Muñoz (Colombia): 16. 5:50pm — No winners in Round 7. (Surprised?) Colombian candidate Eduard Cifuentes Muñoz withdraws. 7 continue for 3 remaining seats, including “not qualified” candidates Jorge Antonio Urbina Ortega (Costa Rica) and Javier Laynez Potisek (Mexico). Olga Venecia Herrera Carbuccia from Dominican Republic sole remaining “qualified” candidate from Latin America & Caribbean group. 6:12pm — No winners in Round 8. We get to do this again tomorrow at 3:00pm. 3:10pm — No one elected in 3rd round of voting. UK’s Morrison come closest with 62, but 77 needed in this round (@USfortheICC). DRC’s Mindau withdraws from election. Remaining: 9 candidates, 3 seats. 4:40pm — No winners in round #4. Governments “consulting” on withdrawals. Round 5, according to @_CICC, will be an open ballot. This might go until tomorrow. 5:00pm — What is an open ballot? Basically, the minimal voting requirements for regional and gender candidates is discontinued in round 5. Consideration in regard to Lists continues, so States Parties must still vote for at least 1 candidate who has List A experience. (h/t @USfortheICC). 5:20pm — Open balloting will continue with all remaining candidates until another List A candidate is elected. In any further rounds, the candidate(s) receiving the fewest votes in the previous round will be eliminated from consideration – as long as there remains at least twice the number of candidates as available seats. So if one more candidate with List A experience can pull out a win in Round 5 tonight, the lowest scoring candidate will be dropped and 7 candidates will be considered in what will amount to speed rounds tomorrow morning. Another candidate (or more if there is a tie for last place) will be dropped each successive. I expect 2-3 candidates to withdraw however before these elimination rounds force them out. 5:53pm — @USfortheICC confirms that translation services will continue until 6:15pm, allowing time for reading of 5th round results. Round 6 will take place at 10:00am tomorrow. 6:07pm — That’s all for tonight, folks. No additional candidates elected in Round 5. We remain at 9 candidates for 3 seats. Open ballot voting will continue tomorrow afternoon at 3:00pm. 10:00am — Judicial elections will continue shortly. This morning “live-blogging” will be a summation of Tweeters on site because @UNWebcast decided not to show judicial elections. 10:17am — Two candidates have withdrawn their candidacies: Bankole Thompson of Sierra Leone received 3 votes and Gberdao Kam of Burkina Faso received 10 votes in round one. Fourteen candidates remain for four seats on the bench. 10:33am — It’s worth reviewing the MVRs as the balloting continues. Camorra’s election yesterday fulfills 1 of the List A seats requirements, 1 of the GRULAC seats, and 1 of the seats reserved for a male candidate. 10:43am — Hamani Nouhou from Niger withdraws from consideration. Had secured 34 votes in round one. 11:00am — Matthew Lee of Inner City Press says that one of the four “not qualified” candidates was promised quid pro quo support by France. 12:03pm — Robert Fremr elected in 2nd round with 77 votes. His election satisfies the Eastern European MVR. Czapliński received 46 votes in round 1 and ? votes in round 2, so likely to stay in the race anyway. 12:08pm — Serghides from Cyprus and Bria from Central African Republic withdraw from consideration. Serghides was ranked “not qualified” by civil society panel. 12:27pm — @UNWebcast says on Facebook that it can’t show the second plenary because it’s “a closed meeting. There is no TV coverage, no webcast. This is the meeting during which they are electing the six judges. Sorry…” Given that the results are being posted here and numerous Twitter accounts moments after they’re announced, this is ridiculous, eh? 1:03pm — Results of 3rd round will not be announced until 3:00pm. More withdrawals? Possible re-vote? 3:00pm — The Assembly will re-convene this afternoon for election of six new judges. Live-blogging will not be possible as the afternoon session is, without explanation, not being webcast as the morning session was. Updates will be shared from those tweeting on site in New York, including @USfortheICC, @CGS_DC and @_CICC. 4:05pm — The judicial balloting is underway, after a delay due to one delegation not having a microphone at their table. 5:50pm — Still waiting for ballot results…. 6:10pm — Two judges elected on 1st ballot – Anthony Carmona from Trinidad and Tobago (72 votes), and Miriam Defensor-Santiago from the Philippines (79 votes). 10:00am — Mr. Christian Wenaweser (Liechtenstein), the outgoing President of the Assembly of States Parties, has convened the 10th session of the ASP, welcoming two special guests – the President of Botswana and the UN High Commissioner for Human Rights. The Deputy Secretary General is also present. He notes the expansion of the Court to 120 States Parties, matching the number of states which signed the Rome Statute at the founding conference in 1998. 10:10am — The President notes that states parties have agreed by consensus to elect Deputy Prosecutor Fatou Bensouda as the new Prosecutor and asks all states to extend their support to her. 10:15am — The President insists the Court should not be an expansive institution, and that states parties should keep in mind their taxpayers who ultimately pay for the Court’s work. 10:18 — The Assembly has elected by acclamation Ambassador Tina Intelmann (Estonia) as President of the Assembly for the 10th to 12th sessions (2011-2013). Amb. Intelman, the first female President of the Assembly, has taken the gavel and is now addressing the Assembly. She looks forward to universal ratification of the Statute and calls on State parties to keep their responsibilities of prosecuting “Rome Statute crimes” in the national courts as the ICC can only work at the “tip of the iceberg” in prosecuting genocide, war crimes and crimes against humanity. 10:26 — Deputy Secretary General Dr. Asha-Rose Migiro shares greetings from the Secretary General, praising the work of President Wenaweserand outgoing Prosecutor Moreno-Ocampo, and pledging continued support for the Court “whenever possible”. They call on States parties to elect the most qualified judges on Tuesday. 10:31am — Seretse Khama Ian Khama, President of Botswana, is now addressing the Assembly. He notes that the Court is often the only resort to victims of mass atrocities, but not all states are party to the Court. He calls on the Assembly to debate universal jurisdiction of the Court, regardless of whether a state has ratified the treaty. 10:40am — He notes the support of the Court by African states from its founding, and encourages a “special and mutually supportive relationship” that should exist between African states and the Court. Unfortunately, there has been efforts among some African states to undermine the Court due to the perception that the Court unfairly goes after African leaders, despite most investigations against African leaders being the result of invitations from those states. 10:42am — Khama mentions Syria as a possible case for the Court to investigate outside of Africa. 10:46am — Khama calls out China and Russia (not by name) for failing to support UN Security Council resolutions on ending mass atrocities. He urges States parties to not shirk from going after heads of state when they commit crimes under the Statute. He reiterates Botswana’s commitment to meeting its obligations under the Statute. 11:00am — Navi Pillay, the UN High Commissioner for Human Rights, praises the “deterrent effect” of the Court and the role the Court plays in demonstrating how to carry out fair trails in high profile cases. She calls the Assembly a “progessive avante-garde” for global justice, notes the six new states that have ratified the Rome Statute just this year, and that state parties now represents 43% of UN members. She calls on the Assembly to define “objective criteria” for when the Security Council can and should refer a case to the Court, and when the Council should defer cases under Article 16. 11:08am — Pillay challenges those who consider the Court a cause of instability, pointing out Security Council Resolution 1970 on Libya. But she is worried about that state parties that have yet to adopt complementary domestic legislation on war crimes, and calls on #ICC state parties to adopt comprehensive legislation incorporating the Rome Statute in domestic penal law. She ends her comments by urging states to to elect the most “qualified candidates with the most relevant experience” and ensuring the continued integrity of the Court. 11:15am — Four states parties – Chad, Comoros, Gabon and one other – are in arrears to the Court and will not be allowed to vote in this session unless they submit a request for exemption otherwise. The President tables further discussion until just before elections for judges at 3pm this afternoon to allow these states to submit their requests. 11:25am — Court President Judge Sang-Hyun Song is now addressing the Assembly, noting the Court’s increased workload in recent years and the accompanying budget issues. He tells the Assembly that a zero-growth budget would undermine the Court’s ability to do justice. He feels that this is a historic point in the Court’s – 120 states parties is a laudable accomplishment, “but it leaves 70 to go.” He says there will always be critics of the Court, claiming it is politicizes, but he asserts that their work in firmly rooted in the Rome Statute, and the Assembly gathered today is the body which holds the Court accountable to this non-politicized nature. 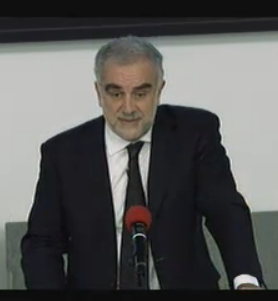 11:42am — José Luis Moreno Ocampo, who has served on the first Prosecutor, is now addressing the Assembly for the last time. 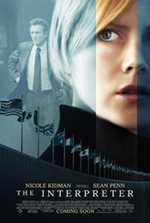 He notes the fears that State had in the early years of an frivolous independent Prosecutor and how his office worked to adopt policies on when and under what circumstances prosecutorial action would be initiated – for example, only when national efforts were not underway. He worries about two challenges – a less independent Court due parochial interests with incentive to mobilize dissent against the Court, and an isolated Court that issues rulings that are mostly ignored or sidelined due to arguments about peace versus justice and other political interests. 12:00pm — Moreno Ocampo points out that the Court is being seen as a critical element in global governance, that even non-state parties U.S., Russia and China on UN Security Council supported the referral of Libya to the ICC this year. 12:05pm — Assembly members offer weak applause at conclusion of Moreno Ocampo’s remarks. Many were reading or showing other signs of disinterest while he was speaking. 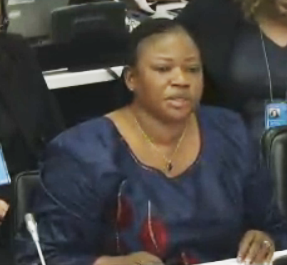 ICC Prosecutor-elect Fatou Bensouda addresses the Assembly of States Parties following her election by acclamation. 12:09pm — President moves Assembly to next agenda item – the election of Fatou Bensouda as the next Prosecutor. The Assembly elects Bensouda by acclamation to a nine-year term, starting in June 2012. 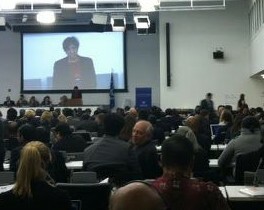 Ms. Bensouda speaks from the floor. 12:19pm — President Intelmann notes that the goal of the election was consensus and that a search committee was established to facilitate identifying a candidate that could be elected by consensus. She notes the transparency of the selection process, pointing out that the committee’s report was made publicly available.